Columbia Rubber Mills provides extremely durable, wear-resistant rubber rollers and precision rubber products for steel, metal and aluminum processing equipment. We manufacture and recover bridle rolls, exit rolls, squeegee rolls, pinch rolls, wash rolls, rinse rolls, wringer rolls, steering rollers, hold downs, and more. We have a range of specialty materials and compounds available, and numerous finishes designed to make your processes faster and more efficient. Columbia Rubber Mills will work with you to develop the perfect rubber roller for your metal processing application. 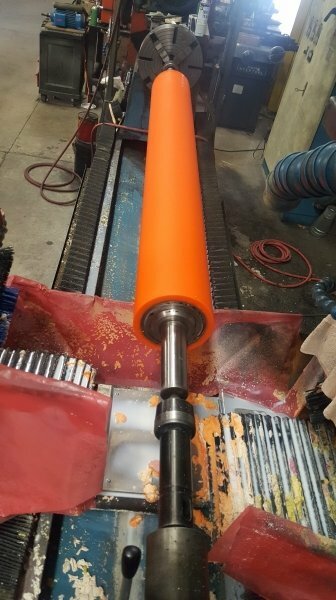 Request a quote on the squeegee rolls, wringer rolls, bridle rolls, or other rubber rollers you need, or contact us to learn more. Columbia Rubber Mills can manufacture spare rollers or pulleys (cores and covers) for all your critical positions.